Keltruck, the largest independent Scania dealer in Europe, has launched a new, improved version of its mobile app, which enables users to search its massive stock of used Scania vehicles and find their nearest Keltruck branch. The free app is now available in three versions, for iPhone, iPad and Android devices. The app was first launched 18 months ago in an iPhone-only version. As well as supporting more devices, the new version 2 app has been improved to provide faster, more robust performance. A user-friendly interface makes it easy to search for used vehicles, with a new enhanced gallery providing multiple images for each truck. Users can register an interest directly from the app, and Keltruck’s used vehicles sales department will then contact them. As well as finding used vehicles, the app provides an interactive map, which enables truck drivers to pinpoint the location of Keltruck’s 21 locations in the Midlands and Wales. The app also provides news about Keltruck, Scania and the transport industry, with direct links to Keltruck’s social media channels. 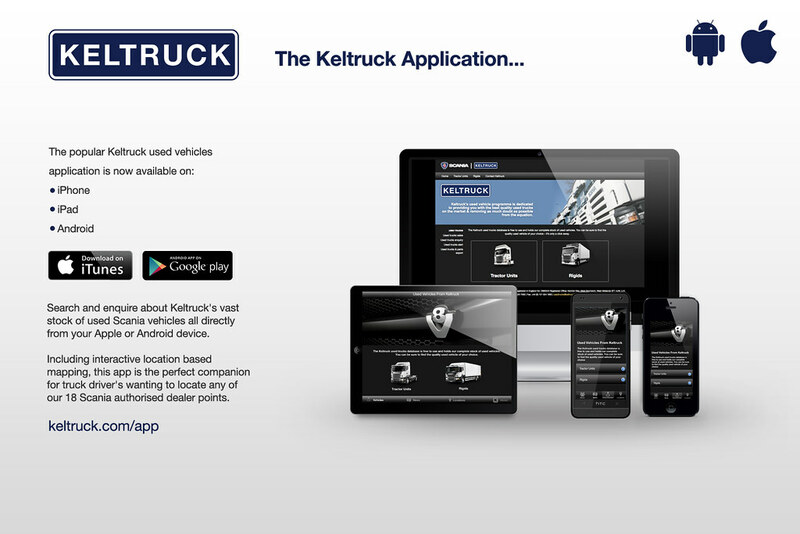 The app is available now for download at the iTunes App Store and Google Play Store, or see keltruck.com/app.